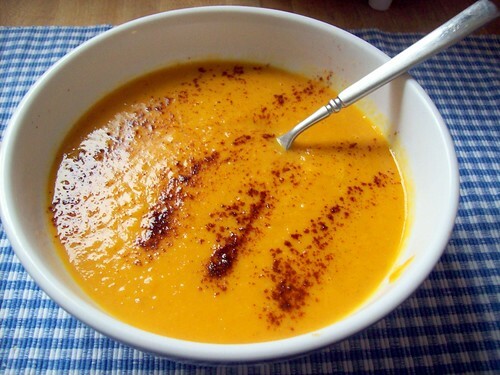 Soup made from vegetables roasted with smoked paprika makes a tasty and nourishing fall and winter meal. 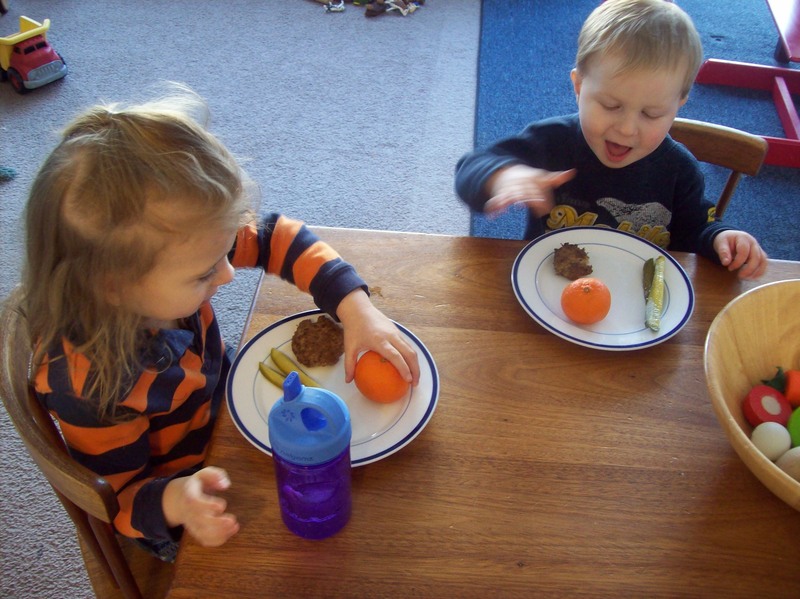 I wasn’t sure how we would like carrot soup, but combined with pumpkin for creamyness and garlic and onions for flavor, it was a hit! I’m excited to make good use of this inexpensive root vegetable. Roasting the vegetables in the oven and cooking the soup itself in the slow cooker makes this easy as well, no pots on the stove to watch or stir. Ghee is the perfect fat to use for roasting vegetables. Ghee has a higher smoke point than butter because it has been clarified to have all the proteins and sugars removed, so only the rich golden fat remains. Since the lactose and casein have been removed, it also is a suitable fat to both milk protein allergic and lactose intolerant people; even those on the GFCF, SCD, or GAPS diet. Lastly, and most importantly here, ghee absorbs and enhances the flavors in herbs and spices and carries them throughout the dish. Roasting the vegetables in the oven and cooking the soup itself in the slow cooker makes this easy as well, no pots on the stove to watch or stir. Ghee is the perfect fat to use for roasting vegetables. Ghee has a higher smoke point than butter because it has been clarified to have all the proteins and sugars removed, so only the rich golden fat remains. Since the lactose and casein have been removed, it also is a suitable fat to both milk protein allergic and lactose intolerant people; even those on the GFCF, SCD, or GAPS diet. Lastly, and most importantly here, ghee absorbs and enhances the flavors in herbs and spices and carries them throughout the dish. 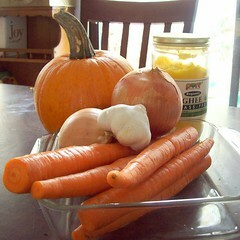 5-6 large inexpensive organic juicing carrots or more smaller ones, scrubbed. Cut carrots into 3-4 inch pieces. 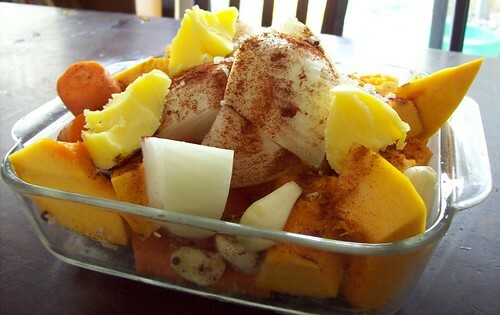 In an oven-safe dish (I piled an 8×8 inch glass dish here) pile all the vegetables, garlic, and pumpkin. Dot across the top with ghee, and sprinkle with paprika and sea salt. Place in the oven to roast at 300 degrees F for an hour. No need to preheat. In a crock pot, place the roasted vegetables and drain the juices and melted ghee from the bottom of the pan into the crockpot as well. Add chicken stock and enough filtered water to cover the vegetables. Cook on low all day, or high for 4 hours. Puree with an immersion blender, or by placing small batches in the blender and blending. Salt to taste. Spoon into bowls and garnish with grated parmesan cheese, cultured cream, and/or smoked paprika. Do you need to blend the veggies into a puree or do they do that naturally? You do need to blend- this can be done with an immersion blender, or by transferring to a blender (like the kind for smoothies). I made pumpkin soup a few weeks ago and it was sooooo good. Can’t wait to try this one — roasting all those veggies first will add an interesting flavor, as will carrots… I never think of all these great variations! Printing now. That sounds fantastic! My husband is going to love this one. Thanks so much for your wonderful recipes! This looks so tasty — and EASY! Love that. I’m trying a yummy Indian inspired butternut squash soup from Barefoot Contessa that you might like. It’s topped with banana, cashews and flaked coconut. Yum! Yum! Yum! I could go for a warm bowl of this right about now! Sitting in a hotel room dreaming about homemade soup. Love this recipe. Can we post on our site? Thanks so much. Enjoying your blog. Can I use coconut or olive oil in place of the ghee? 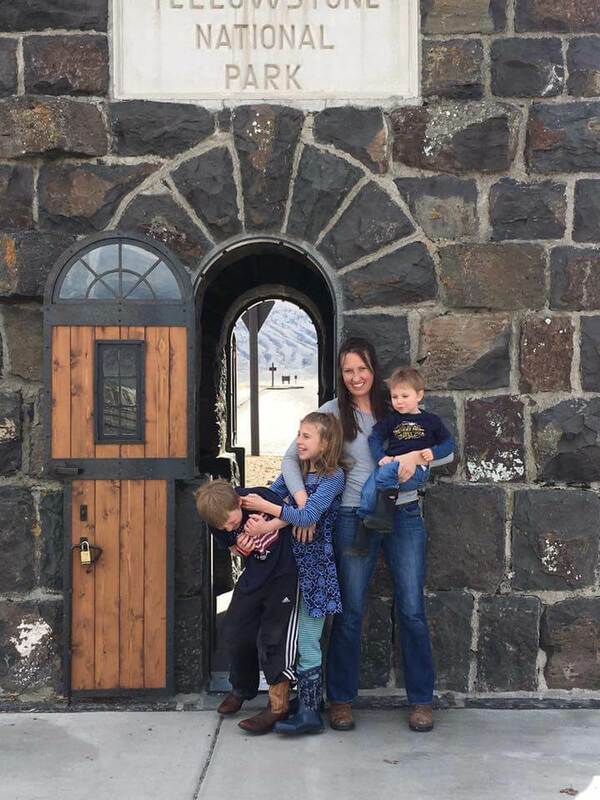 I am a mother of 5, 2 of which are 1 mon. twins, so I can’t go out and find/purchase ghee. Thanks for a wonderful recipe. I love the fact that your recipes call for use of ghee. I grew up eating ghee as part of my everyday meals. Most of the foods were either cooked in ghee or topped with ghee. Making ghee at home is not at all difficult. I make it on a daily basis and top our foods with it. I buy organic butter, because resulting ghee tastes much better than the non organic version, but I have also used butter sticks from Costco. In a heavy bottom pan, add couple of sticks of butter and heat it on medium heat. The butter begins to melt and then starts to bubble. You have be sure you monitor the melting process or it can get burnt. Just keep on stirring frequently till the bubbles start disappearing. Turn of the gas and let it cool on the stove. You will see clear ghee on top ( or slightly brown colored) and brown colored solids on the bottom. The clear liquid is ghee. When the pan is cool enough to handle, strain the ghee in a jar/bottle. This is pure ghee. After couple hours it will solidify. I hope this was helpful. Please don’t hesitate to ask me if you need any more help for making ghee. PS: ghee from two sticks of butter lasts for 10-12 days. I usually make ghee on bi-weekly basis and not daily basis.